The game is a very simple, repeating side scroller. 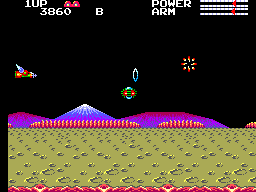 You battle an onslaught of enemies of various types whose primary attack is to ram you out of the sky although a handful of them do have their own weapons to shoot you with. Your craft is capable of adopting a number of weapons to replace the default weapon. These weapons can be acquired by destroying the enemy supply trucks as they wander on to the battlefield and collecting the weapon that falls out. Just what weapon you get is decided by pushing Button 1 as the letters scroll across the top of the screen. Each letter represents a different weapon type. Most weapons are merely more powerful versions of the default weapons that can pass through one enemy and destroy another enemy behind it. Other weapons spread out ahead of your craft or behind it as well while weapon C is a huge energy beam that projects forward clearing everything immediately in your path. You have your collected weapon until it runs out of energy and you return to your default weapon. Depending on which weapon you have acquired your craft will either be in fighter mode or robot mode. In reality there is no discernible difference in how your craft handles only how it battles the enemy with your collected weapon. You have a shield which affords you a few hits and three lives which can be supplemented after every 40,000 points. 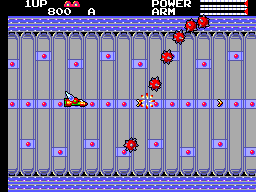 Like many shooters from the early 1980s this game is about scoring rather than progression. The game keeps looping after you battle a giant robot in the underground stages until you run out of lives. The look of the game is rather uninspired and feels like a leftover from the days of the Sega SG-1000 especially at the home screen. The fact it was intended as a Sega Card release explains a lot since the size of the game is very small so they had little to work with. I couldn't help but get an early NES/Famicom feel about its look. What I will say in its favour however is that it is no worse than any of the games released at around that time such as "Teddy Boy" and the Japan exclusive "Satelite 7" so in that context it is ok. The in-game music is quite catchy and clear though it is the usual high-speed bings and bongs. It complements the gameplay nicely and will probably linger in your head for an hour or so after you put it down. Your craft is rather stiff to control and moves a lot slower than many of the enemies. You can argue this adds a certain level of strategy to the game since you have to think ahead as to how you are going to confront them but it does make getting out of trouble quite difficult. I sometimes play this with the Master System's Control Stick and I am not sure why it is but it seems to make the game even harder and I quickly replace it with a controller. 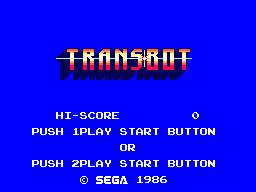 When my collection was small I often played "Transbot" but as it grew I found myself ignoring it more and more. When I decided to write this review I got it out for the first time in well over a month so all I can say is that for me there is little replay value. It's the lack of progression. I hate games where I don't feel like I am going anywhere or achieving anything. I would categorise this as a mediocre title which is a shame because it could have been so much more with very little effort. I wouldn't say it is bad but I wouldn't say its good either. Put it this way; "R-Type" has nothing to fear from it. If you find it for cheap (I paid �3 and it came in the original box) then go for it.